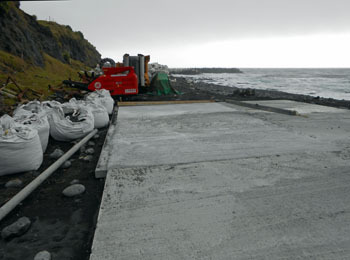 News of damage to Tristan da Cunha's Calshot Harbour that was repaired during 2014. Following the news published on 20th June 2014 (see report below) that DFID will only be supporting emergency repairs to Calshot Harbour and not major refurbishment or the construction of a new harbour, we aim to report regularly on the state of the harbour and progress of local repairs, also funded by an EU grant. Puma Road is the access road which connects the harbour to the village. The fishing factory is the large grey building sited overlooking the harbour. South Quay forms the landward wall of the harbour with the large gantry crane sited on top as shown in the main photo above. Its vertical face is always vulnerable to waves that sweep into the harbour, especially during northerly winds. Showing 2014 remedial work to repair Calshot Harbour. and for any confusion or misconception this may have caused. has had a repair job done on it. The sea conditions always meant it was a difficult task with tide table consultation being essential. 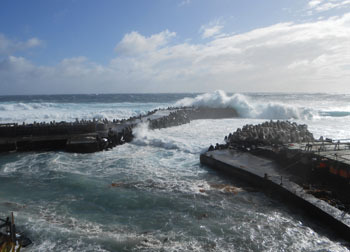 Left: Photo taken on 24th January 2014 shows South Quay with the large block displaced by wave action and lying obliquely, so exposing the under-quay area to erosion. Photo taken on 27th January 2014 shows work to secure an unstable cliff-face above Calshot Harbour Road - using a wooden buttress construction and concreting. Further work to make the unstable cliff below the Fishing Factory and Calshot Harbour is being planned. The first new dolos mould being cast with concrete on 18th February 2014. 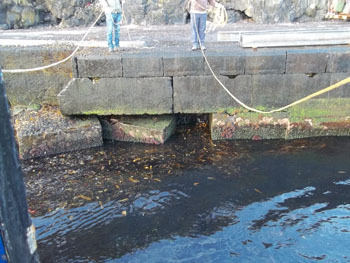 Dolos are placed outside the Western and Eastern Quays to dissipate the power of waves and offer protection to the actual quay structure. and to move blocks from the area. The sea did get the better of us at times and even smashed some pre-cast sections that had been placed there to create a cofferdam for concreting. Right: Photo taken on 25th March 2014 showing framework to enable shoring to be installed prior to in-filling with concrete. 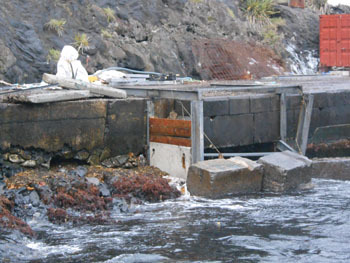 the damaged cofferdam repair works. and pre-cast concrete sections lowered into it to form a cofferdam. and twisted the steel frame. 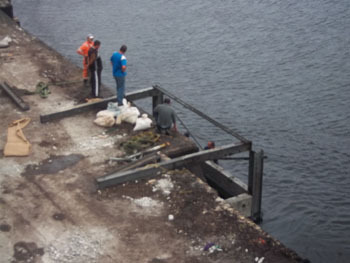 The broken concrete sections can be seen lying on the quayside. Photo taken on 24th May 2014 showing a storm breaking into the harbour and engulfing the quays. In particular these swells will break on the vertical South Quay (left side of right hand photo) where the main gantry crane is situated. and he pushed a long ply board right into the voids which is when we realised there was a problem. There may also be damage to the crucial Eastern Quay and especially the Western Quay that felt the full force of the storm. 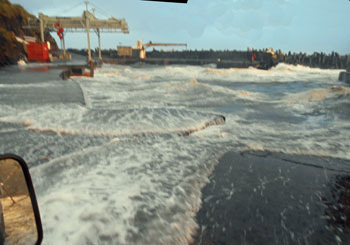 The wave shown in the photo above right is shown engulfing the seaward end of the Western Quay. 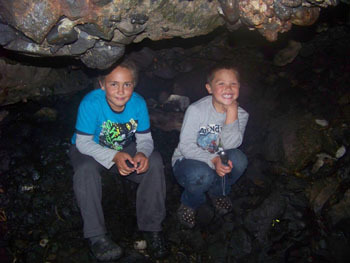 inside caves that have been washed out by the sea under the South Quay of Calshot Harbour in early June 2014.
and the concrete was cast into two areas using pre-cored holes. Once again, these works highlight the fact that the current harbour is in a very precarious state and we know that there will be other areas yet to be discovered which will require similar treatment. The relentless wave action has seriously undermined the southern quay and possibly large sections of the eastern and western quays which will require further costly and time consuming remedial works . 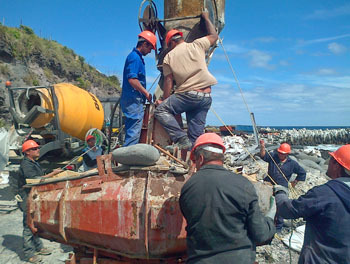 Dolos casting, which has been on hold while all efforts were concentrated on the Water Project and repairs at the harbour started again on Monday 23rd June 2014. 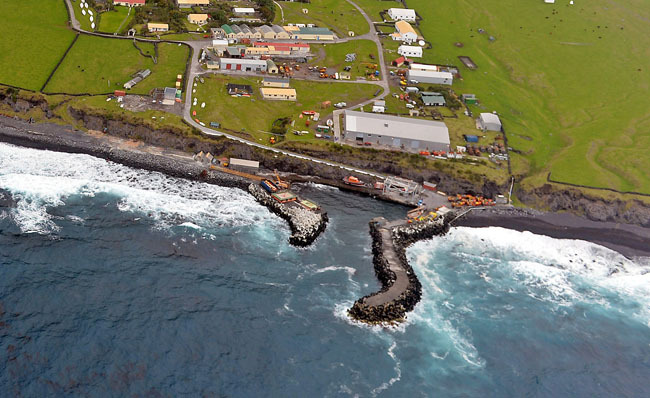 Calshot Harbour at the centre of Tristan da Cunha’s Future Economic Viability as major projects are shelved. 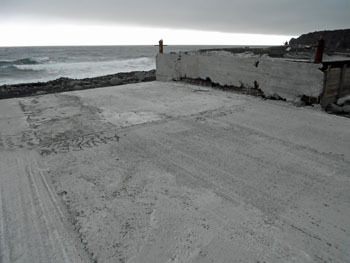 The dire state of Tristan's Calshot Harbour remains a major concern for the remote island community as this week major projects are presently set aside as minor local repairs continue. 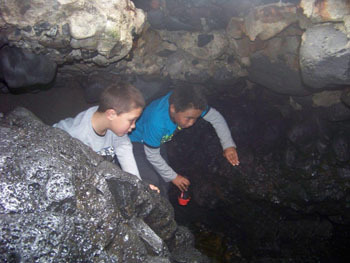 This article is in preparation for the August Tristan da Cunha Newsletter but it is right that its contents are made public earlier. ‘The harbour is unfortunately another story which would give War and Peace a run for its money. As there are significant sums involved, this will continue to take time before a decision is taken. To highlight this issue, we were unable to off - load 200 tonnes of cargo from the Baltic Trader in December 2013 due to harbour conditions. 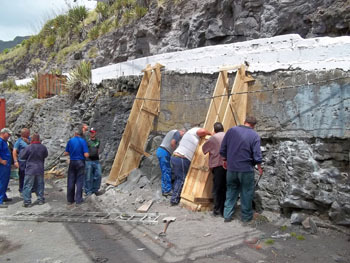 This has led to a domino effect on 2014 sailings, and unfortunately put us behind schedule on several projects. Tristan Government Representative Chris Bates highlighted the worrying state of Calshot Harbour when addressing the Tristan Annual Gathering in Southampton on 26th April raising the issue that if the harbour is not improved the viability of the Tristan da Cunha economy would be in doubt. Following Chris’ statement Sir Martin Holdgate led a discussion during the Annual General Meeting during which he clarified the crucial importance of a good harbour to the future of the Tristan community and urged members to contact their MPs to encourage the UK Government to make a commitment to ensure Tristan has an adequate harbour to ensure the long-term future of the island community. As a result many Tristan Association members contacted their MPs to highlight the critical importance of improving Tristan’s harbour and find out what plans the UK Government had to remedy the situation. ‘The importance of the harbour to the continued sustainability of the island is clear. 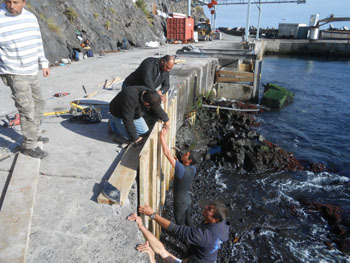 Each time the harbour has sustained damage, the UK Government has funded repairs to ensure it remains functional. Engineers estimate that the cost of rehabilitating the harbour would range from approximately £18 million to £29 million, depending on the cost of the refurbishment. Rebuilding the harbour in a different location would cost around £48 million. I understand the continuing risk that an unusually severe storm will cause catastrophic failure of the harbour. The need for reliable sea access to and from the island must be balanced with the very high cost of the substantial investment which would be required to significantly reduce the harbour’s collapse, and the extent to which this would reduce the costs of further repairs. Back in the UK, Alex Mitham confirmed on 17th June that DFID would presently only sanction continuation of the emergency repairs underway currently at Calshot Harbour and kindly funded by the EU. Presently, therefore a major harbour refurbishment or a new harbour on a different site, outlined as options by Alan Duncan above, will not go ahead.